Countertops, cabinets, and flooring are some of the most important elements of a kitchen. It’s also important that they all match! Considering how much use you get out of your kitchen, you really want to make sure the design of the room flows and is aesthetically pleasing to you. The easiest way to do this is to figure out a main color scheme with a common color in mind, such as cream or white, and then to use bolder colors as accents throughout. As much fun as mixing and matching may be, it’s usually best to keep your countertops, cabinets, and floors all simple so you can keep your kitchen modern and updated without having to do major renovations. Start out by picking that overall color scheme you want to tie everything together with. Using a color chart is a great way to do this—pick two dominant colors and one accent color and be sure they all complement one another. Those two dominant colors are best left as something simple, whereas your accent color gives you some more breathing room to be creative. Consider a classic combination like white cabinets, dark flooring, and countertops that alternate colors. It’s often wise to choose your countertops before anything else as they can be the most expensive element. Additionally, countertops come in so many different kinds of materials, colors, and finishes that it gives you an option to really nail down what you want. 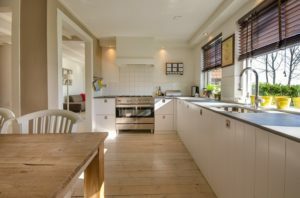 It’s often easier to match cabinets and floors to countertops because of this as well. Applying accents and accessories is the easiest—and funnest—part of kitchen design. Bold colors can be used for an accent wall, decorative elements, or even kitchen appliances like your mixer or blender. It’s pretty common for metallic colors to be utilized in kitchens as well, because they can often give the space a modern, contemporary feel. Feel free to experiment a little and see what works best for you. This entry was posted on Friday, April 27th, 2018 at 12:47 pm. Both comments and pings are currently closed.